Contact lens trial This week marked the first time I've ever worn contact lenses! After having them ordered in especially (I have an astigmatism which means I needed some that weren't in stock) I got them fitted in Boots Optician's in Huddersfield. 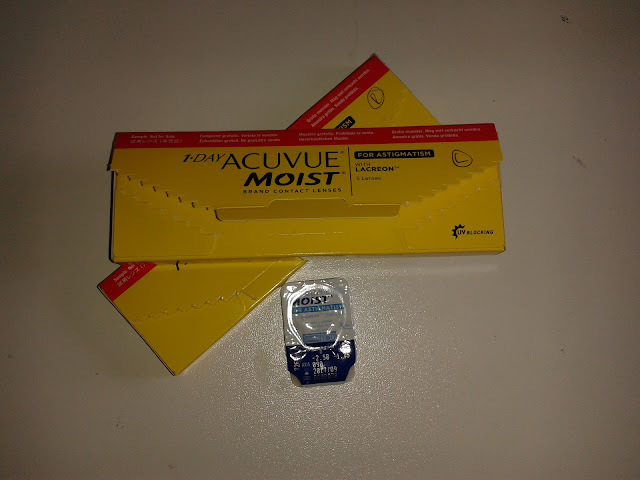 The lenses I have are dailies (this means they are disposable every day) and are by Acuvue Moist. They let in a large percentage of oxygen and when I'm wearing them I can barely feel that they're there. It's really strange to look around when I'm wearing them as I've been wearing glasses every day since childhood so I'm used to feeling my glasses resting on my nose. Putting them in is still a challenge as I spend a lot of time trying to psych myself up to prod myself in the eye! The comments I've had so far have been that I look a lot younger (I agree) and that I should stick to glasses! It's taken me a long time to get contacts as I still remember a comment from a boy at school who saw me without my glasses and told me never to get contacts... it was definitley one of those things that has stayed with me since I was about 17. I don't regret getting contacts for the trial but I'm still considering whether or not I want to keep them!